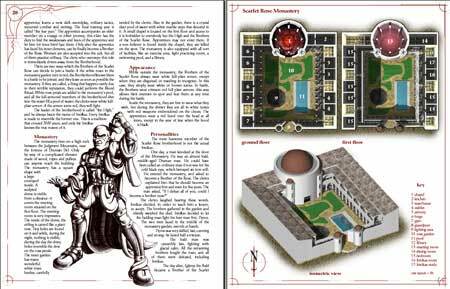 In this sourcebook you can find all you need to know about the Harmony, the force that governs the divine magic on Arthad. 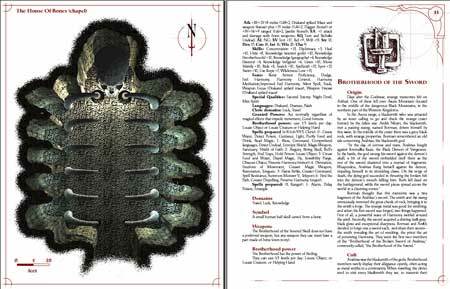 You'll find eight brand-new brotherhoods ready to use in your games, including the famed Scarlet Rose Brotherhood, the Brotherhood of the Black Vengeance, The Sisterhood of the Burning Ice and more; plus: background history about the fallen Gods of Arthad, Spells, Feats, Skills and tips for designing your own brotherhood. You will find some wonderful 3d rendered maps and beautiful internal artwork. Moreover, Brotherhoods is an accessory for any campaign setting, you can plug-in these religious orders in your game with ease. All is packed in the usual Øone Games style with a new printer-friendly internal layout. "There’s too many" Whispered Jaret wiping blood from his blade, "the wall is lost. We shouldn’t stand here anymore..."
His comrades turned toward the clearing between the walls. Hundreds of civilians were clustered around the gates, seeking temporary refuge in the depth of the fortress. "The evacuation is not over yet," stated Urtha bracing the mace against the spiked shield. "If the Zenith break over the wall now, it would be... carnage!" Kendrick lifted the shoulders in order to check out movements in his battered armor "The rampart, we'll stand there ‘til the last citizen is safe inside the wall." "It's suicide," hissed the thief peeking the head over the wall " Damn! They’re coming up!" "It's a good day to die... like everyone else," Breanor laughed bitterly, his brow creased by fatigue lines, "or better a good day to let die!" Weron smiled, bandaging a knee "True, but every second we gain a person remain alive inside the wall. I could ask no more." The comrades look at each other. "Neither could we." Kendrick boomed, lifting his mace, "Company, ready for action" in forma—"
A plate-clad hand blocked him. The cavalier looked over his shoulders. Five red armor clad fighters stood quietly nearby. These Brotherhood clerics stood out of place in their crimson armor. "Let us pass," stated the biggest one. The bearded giant held a white rose gently, "Take your tired men and leave the battlements now. Understood?" The comrades descended the first steps of the stone staircase. "What the hell...." started Breanor but Weron stopped him. "Look," the sorcerer had never seen the cleric so... frightened. The cleric with the rose stood, holding the flower over his chest. The other four warriors stood around the unarmed priest and lifted their fearsome crimson swords, pointing them outside, in different directions. "Eina Somashta Aika Daranng," chanted the bearded priest, closing his eyes. "Rei'tha Daran Yara Somashta," the other four warriors chanted, following their leader. Waves of Zenith barbarians began to climb over the battlements, screaming and cursing. The four armed priests began to spin and twirl, lashing out their weapons at different angles and directions. At every twist they stood opposite to the bearded priest, and at the same time, they moved around the bearded cleric. The spinning was getting faster and faster. Zenith warriors attacked. The four priests became a crimson hissing blur. Barbarians were hacked to pieces. The crimson blur moved along the battlement, clearing its way with blood and screams. The astonished comrades looked over the battlement. All along the wall there were other spinning men. And they were clearing the wall of the Zenith. "What the hell is this?!" swore Breanor. "Gentlemen," an iron voice called behind them, "you've just witness the most feared ritual of the Scarlet Rose Brotherhood." "The Blooming Rose" Weron paled, "They said, The Rose of Blood has ever its thorns. We are the thorns who fill the blood...."
Innikas smiled, "What a surprise; a cultured brother..."
"But... no one could see the ritual and live.... why..."
Innikas stepped away, "A boon for your courage, for your resolution to remain on the wall. Though a little bit more of uncertainty and you'd be blasted away like the Zenith." The screams of the attackers were dying away while Innikas, the High of the Scarlet Rose Brotherhood, descended the wall. 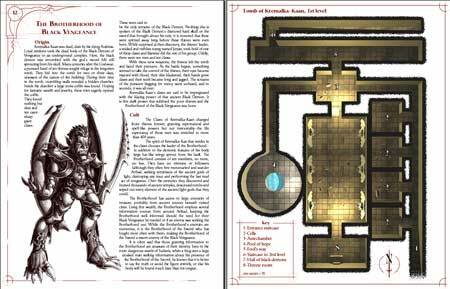 In most fantasy campaign worlds there is a rich pantheon - o ..